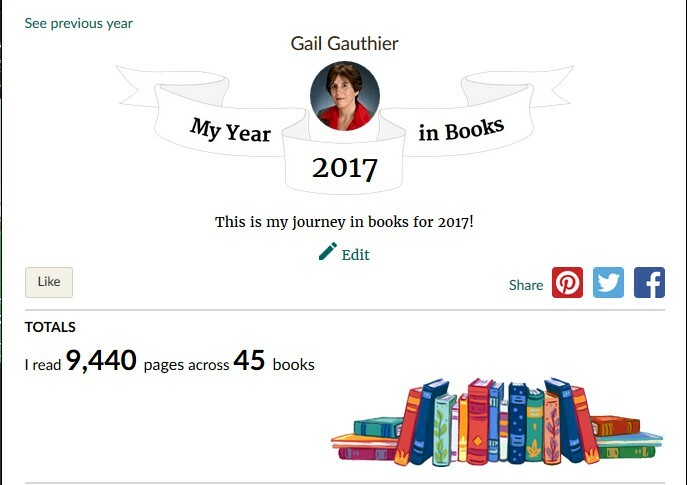 I am active on Goodreads for one reason--it keeps track of my reading and gives me an account at the end of the year. This year I read 45 books, nothing to write home to Mom about. This is down from 83 books last year. Well, that's 2017 for you. I'm not sure if I read more adult books this year than last, but some of my 2017 adult reading wasn't very gripping. In fact, there was one particularly lengthy one that was quite a chore to get through. I kept at it believing that I was improving my self-discipline. I don't feel all that improved. I considered setting some kind of reading goal for this next year, but I'm not comfortable with that. Reading is sort of spiritual. (Though maybe not when you read the kind of books I was reading last year.) Should you set goals for something spiritual? Will having a goal make me feel pressured and wreck my reading mojo? I do hope I break 50 books this year, though.